There's a piece about a Big Cat further down! Great Park’s tawny owl is a brown and grey, short beaked bird, the size of a pigeon. He has a long and distinguished history. His ancestors saw the last of the flying dinosaurs. Ancient man drew images of owls on the walls of their caves. Greek poets saw their grave faces as symbols of omen or wisdom. Writers and poets have praised the owl in their stories. An owl features in William Shakespeare’s play, Hamlet. In the Harry Potter books, Neville’s grandmother, Augusta, has a tawny owl, just like the one at Great Park, to fly things to Neville that he has forgotten. Unlike some owl species, the ‘Tawnys’ prefer not to cross water but stick to a landmass, with habitats from the UK to South Korea and beyond. But don’t expect traveller’s tales from Lord Stomper’s bird, for like most of us, once he’s found a nice place to live, he’s in no hurry to leave it. 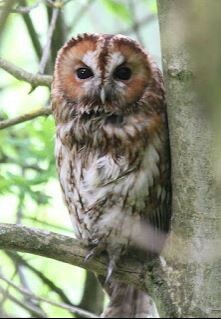 Tawny Owl usually mate for life. The families prefer to settle among really big trees. There they sit, watching for dinner. Their eyeballs are almost immoveable. Instead, they turn their whole head to left and right or even almost upside down in order to see something clearly. Owls can hear mammals communicating with each other – useful for spotting their dinner before their dinner spots them. The way they do this is remarkable. Ear openings are neatly tucked, one higher, one lower, behind and to the side of their eyes. The feathers set around their eyes and ears move about their disc-like face in order to trap and amplify the sound. Useful sounds coming from the owl’s left side are caught by the left ear first and only then by the right. But sounds coming from the right will be caught by the right ear first and then by the left. Now all the clever owl needs to do is to adjust his head until both ears can hear the sound at the same moment. This can take as little as 0.00003 seconds. Amazing! Once dinner is targeted, the downy feathered wings allow the birds to glide down silently and so surprise their prey. A tawny owl is able to lift a large vole or rat or a half-grown rabbit. They also eat shrews, field mice, insects and small birds. No self-respecting owl goes ‘to whit, to whoo.’ But what noise exactly does issue from that noble throat? Experts disagree. So I’m claiming that the female goes ‘to-wit’ to which the male replies ‘to-woo.’ And they might go ‘hoo-hoo-hoo’ or even ‘kee-wick. If owls live near you, listen carefully to decide whether I’m right. ﻿Ares would have liked to have spent his life in the wild, but over-hunting of big cats has made that choice impossible. Instead he spent a long and happy life at the Wildlife Heritage Foundation. 2. At one time jaguars roamed all the way to the US-Mexico border, but jaguars are now only occasionally sighted in Texas and Arizona. 3. 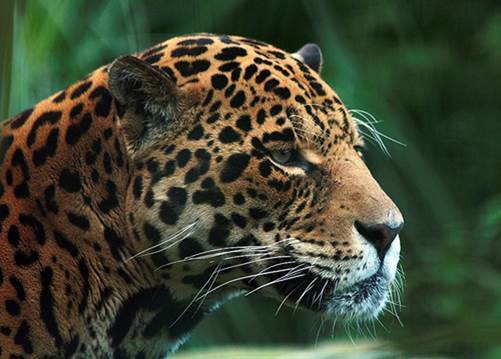 The name jaguar comes from the Native American word yaguar, which means "he who kills with one leap." 4. Their fur is usually tan or orange with black spots, called "rosettes" because they are shaped like roses.